Art Pepper(as), George Cables(p), David Williams(b), Carl Burnett(ds), 1981/11/22. 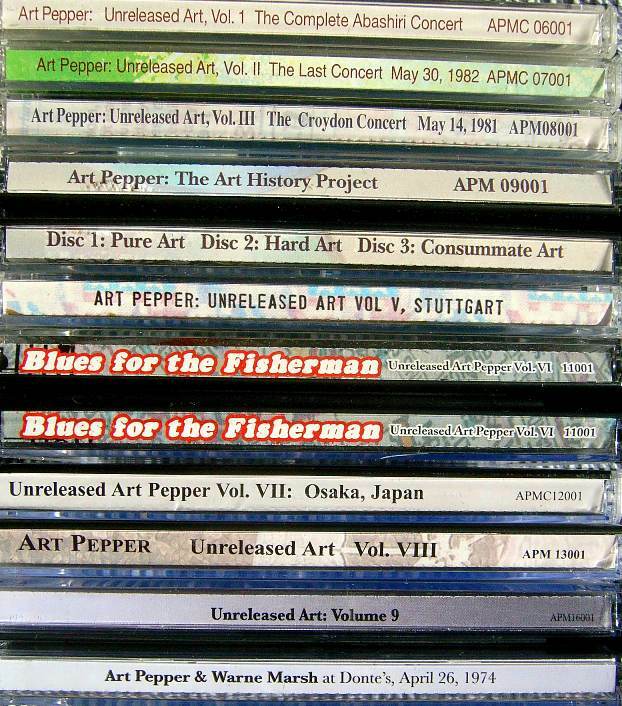 ART PEPPER(as,cl), Roger Kellaway(p), David Williams(b), Carl Burnett(ds), 1982/05/30. Art Pepper(as), Milcho Leviev(p), Bob Magnusson(b), Carl Burnett(ds), 1981/05/14. Art Pepper(as), Milcho Leviev(p), Bob Magnusson(b), Carl Burnett(ds), 1981/05/25. Art Pepper（as）, Milcho Leviev（p）, Tony Dumas（b）, Carl Burnett（ds）;Originally Recorded By Mole Jazz, live at Ronnie Scott's, London, 1980/06/27,28. Art Pepper(as, cl), George Cables(p), David Williams(b), Carl Burnett(ds), 1980/11/18. Art Pepper (as), Smith Dobson (p), Jim Nichols (b), Brad Bilhorn (ds);　Live at the Winery, 1976/09/06. Art Pepper (as), Warne Marsh (ts), Mark Levine (p), John Heard (b), Lew Malin (ds) and Bill Mays (p Disc 3, 4), 1974/04/26.